In a bowl mix together the Chinese 5 spice, honey and soy sauce, set aside. 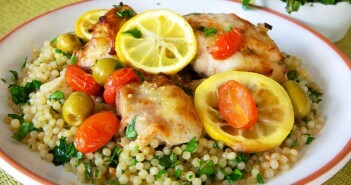 Season the chicken thighs and coat with olive oil. Lay them on a roasting tin and cook for 15 minutes. Take them out the oven and coat well with the 5-spice mix, return to the oven for a further 15 minutes. Should be crispy and slightly sticky. While the chicken is roasting prepare the ingredients for the stir-fry. Remove the outer leaves of the Chinese cabbage and finely slice. Cut the spring onion into 1 cm slices and peel and grate the ginger. Finely chop 3 tbsp of coriander leaves. When the chicken thighs are ready remove them from the oven, transfer them to a plate and cover with foil to keep warm. Add 50ml of boiling water to the remaining juices stir well and set aside. Bring to the boil a large saucepan of water, add the rice noodles and leave to soak for 5 minutes until soft (time may vary check the instructions on the packet). Break the noodles up with a fork drain and set aside. In a large frying pan or wok heat 1 tbsp of vegetable oil, add the spring onions, ½ tsp of salt and the grated ginger, fry for 2 minutes then add the Chinese cabbage and juice from the chicken and fry for a further 3 minutes. Stir in 2 tbsp of the chopped coriander. 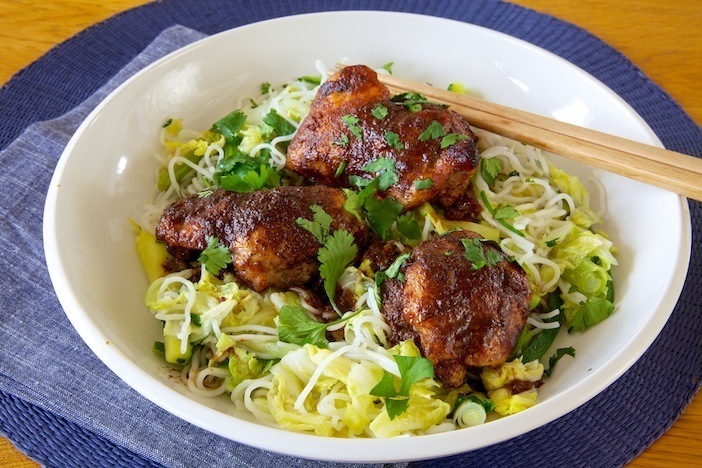 Serve the chicken thighs on top of the noodles and garnish with the remaining coriander.